Notes: Château de la Garde or castle of La Roche, is an ancient castle in the commune of Albaret-Sainte-Marie in Lozère (France). 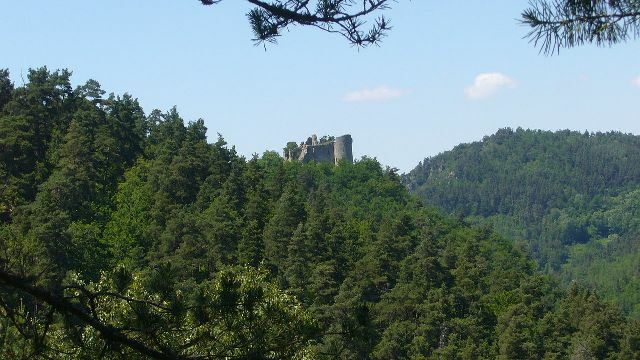 It is now in ruins and is not easily accessible.The castle is located in the town of Albaret-Sainte-Marie, in the northern department of Lozere. Overlooking the Truyère, and he was a lookout point for the owners, the barony of Apchier facing one hand to the barony of Mercœur and the other in the Auvergne. Mercœur Apchier and had two of the eight baronies of Gevaudan.Its construction probably dates back to the late nineteenth century. The castle with the job to protect the castle from more Apcher south.